Download the sample games below (all are PDF files) to see what Never2Old4Games is all about. Each file contains complete instructions for the game, an estimate of how long it should take to play, and any special supplies that might be needed. Alma is a great shopper, but a really bad speller. She’s going grocery shopping today, but she has misspelled every item on her list by one letter. 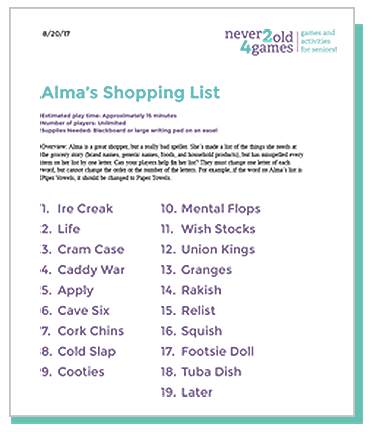 In this game, players must help fix Alma’s list by changing one letter of each word (without changing the order of the letters). For example, if the word on Alma’s List is nice, it should be changed to rice. 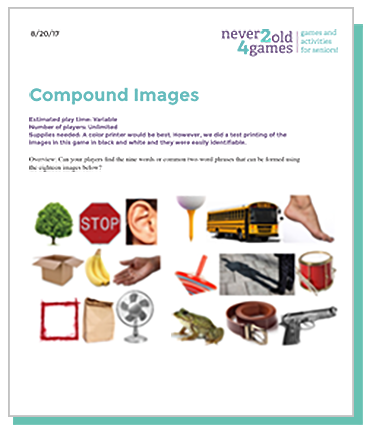 Can you find the six compound words that can be formed using the twelve images provided? The one word(s) that completes both “credit” and “trick” is card—making credit card and card trick. Rebuses have been around for hundreds of years. They are visual games that use pictures to represent words or parts of words in a phrase or sentence. In this case, the pictures represent parts of the names of famous people (both real and fictional). In this game, your players must provide an answer for each letter of a given four-letter word. Take the word DESK, for example. If the first question were “Name an author for each letter,” four correct answers might be: Dickens (Charles); Eliot (T.S. ); Steinbeck (John); King (Stephen). 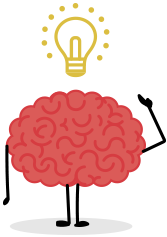 Given a list of three to five items, can you find the one item that doesn’t belong … and, explain why it doesn’t fit with the others. Want to see more sample games? Fill out this form and we will email them to you. …and don’t worry, we hate junk mail too! We will not share your email address with anyone.